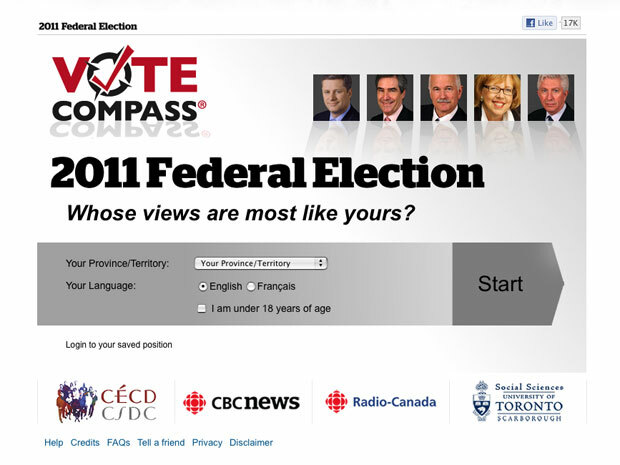 You've been living under a rock if you don't know that there is a Federal Election Monday May 2nd, 2011 in Canada. I never really cared about politics in the past because I didn't think my vote would make a difference and frankly I just couldn't be bothered. With all the craziness going on all over the world lately, I have started to pay more attention to whats going on and I think its important as citizens of this great country to exercise our freedom of speech and right to vote. We as citizens, should have some say in the way government is run. I got talking to a friend of mine who informed me that CBC has come up with an excellent online assist to help the electorate determine which party best represents their political aspirations. Its a survey that asks a series of questions and based on your responses shows you what political party best represent your political views. Get out Monday May 2nd, 2011 and VOTE!